This is basically a drive-up summit. But in order to reach the actual summit, or even the activation zone, permission must be gained. It’s been said in other activation reports that permission can be gained from security personnel at the observatory. 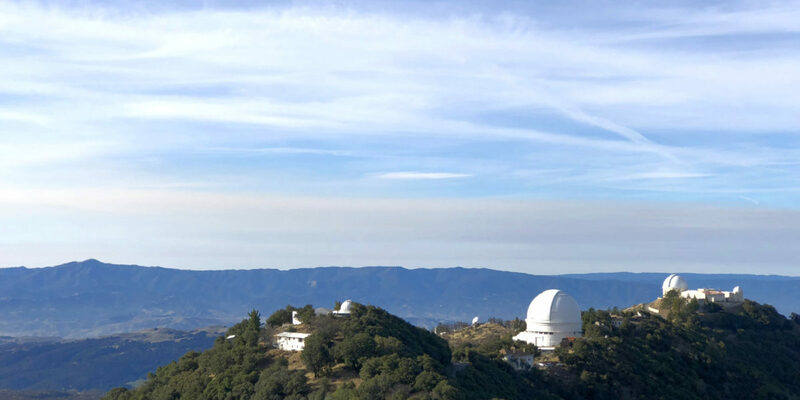 Since I would be arriving before the observatory opened, I relied on other means of gaining permission—by way of a friend contacting CAL FIRE for permission. They occasionally operate the tower on this summit. I had permission to enter on foot, but to leave the tower alone. Leaving my house around 0600, I noticed it was quite cold out, so I threw an extra jacket in the car. With a temp of around 36F at my house, I anticipated sub-freezing temps up on the summit. On the way to the summit, before beginning to gain elevation, I looked at the outside temperature reported by my car. 38F – not too bad, but a bit chilly! Stopping for a quick break on the way up, I took another look at the outside temperature—it was going up! It’s an inversion! It was beginning to look like I would have very favorable conditions. Now up to 55F – balmy! Approaching the summit, I went right past the main observatory and continued along the summit ridge to the pullout for Copernicus. You’ll know you’re close when you can see the fire lookout. Coming from San Jose, heading east on Route 130, the pullout for Copernicus is on the left. There’s little enough traffic through here that turning left into the pullout is easy enough. I pulled in and parked. The gate up to the summit is a short walk away. Parked facing south, ready to go! The sun was just a few minutes above the horizon when I began my short walk up the summit. The gate to the summit makes it very clear that they do not want you here without permission. On foot, it’s easy enough to just walk around it. With all of the signs posted, I’d definitely want to make sure I had gained permission! As short as the road is, it gains elevation pretty quickly. Within a couple of minutes, I had a great view of the surrounding area, and the sunrise. The road ends near a radio tower, with some elevation and the lookout tower still above. There are a couple of different trail options. I took the more obvious one, which looked like it skirted around the southwest side of the lookout tower. It did just that. I’d heard of the tower being manned in other reports and from friends. But today wasn’t one of those days. The trail goes pretty much up to the base of the tower, then back down the other side of the peak. I followed it to that point, where there was a nice tree in which to put the high end of my antenna wire. I set down my gear and got to work setting up. Setup was pretty trivial. I threw the far end of my end-fed wire over a sort of high branch on the tree (it wasn’t a super-tall tree), then walked down the hill a little bit. I used my 4-meter squid pole to keep the wire up off the ground, with the wire going pretty vertically from there to my rig on the ground. The whole thing was pretty much a sloper pointing east, along with east-sloping summit itself. Cell reception was on and off, very marginal. I probably could have self-spotted if I really had to, but I decided to just rely on RBNHole for automatic spotting. I’d posted an alert earlier, and was pretty much right on time for it—easy to do when you’re driving to a summit. I started out on 30 meters, checking to make sure the frequency was clear, then calling CQ SOTA. Within a few minutes, I was making contacts. By the way, I typically run about 16wpm character speed right now, with “Farnsworth” spacing, for an effective speed around 13-14 wpm. Most chasers seem to get that I can’t go super-fast, and they’ve been very accommodating. As the sun came up, the temperature became downright pleasant. I took off layers as it warmed up, eventually down to my t-shirt! This seemed to be a lucky activation, since the contacts were really rolling in. It was all I could do to keep up and work through all of them on 30 meters. By the time I finished on this band about 30 minutes later, I had 22 contacts in the log. More than enough to call it a day! Instead, since I had planned to be up here at least an hour, I took a small break. I walked around a bit and made a couple of contacts on my HT. Certain spots on the summit allowed cell reception. I received a spot for George KX0R up on another summit, so I went and switched my antenna to 40/20m operation and tuned to his frequency on 40 meters. I was pretty quickly able to get that summit-to-summit (S2S) contact on the log. Probably the hardest part of that (for me, anyway) is exchanging the whole summit reference for it. Sure, I could check later to see what summit he was on, but then I don’t feel like it’s a true S2S contact. Following that, I started calling CQ on 20 meters. This netted a bunch more contacts, all over the United States, and a few from Canada. The bands were really working in my favor today! The real magic came toward the end of working through the stations, when I thought I heard an “EA” call. I was in disbelief—surely it was the end of a domestic call, right? Nope! It was indeed a station calling from Spain. As it turned out, it was Jorge EA2LU. It took a little bit of back and forth to get call signs and signal reports straight, but we did it! I’d never gotten a European station, so in addition to already weak signals fading in and out, I had to work through my disbelief! I got a few more contacts on 20 meters (total 22) before moving on to 40 meters. By this point, I was past my planned departure time, but I didn’t want to leave out those who might be looking for me on 40 meters. I got several more stations on 40 meters, mostly within a few hundred miles. One of these was a summit-to-summit with Mike AC0PR over in Utah. That was a pleasant surprise! I made 10 contacts on 40 meters. While I was packing up, I turned up the HT so I could hear anyone who might be on. I heard a couple of stations, one of which was talking to someone flying a plane—an aeronautical mobile station! Once they finished, I threw out my call sign, hoping to get one or both of them in the log. The aeronautical mobile came back. We chatted briefly, exchanging signal reports and locations. He said he was about 130 nautical miles away from me at an altitude of 13,000 feet! Talk about good reach with my little 1.5 watt handheld radio! The signal got weaker as he flew away from me, so we ended off. This activation definitely set a record number of contacts made for me! It’s definitely not something I was going for—I simply wanted to give all potential chasers a chance, and I had the time. If this is what happens when band conditions are “bad,” what’s it going to be like when they’re good? Whoa—this is a long one! I think I got one of these wrong—it’s marked with an asterisk.